Add some outdoor space to your restaurant with our line of commercial outdoor restaurant chairs, outdoor restaurant bar stools, and outdoor restaurant tables. 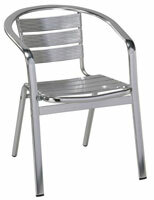 Our aluminum bar stools and aluminum chairs are built to last outdoors for years. Our outdoor stainless steel table top and aluminum table base are the prefect compliment to our outdoor chairs and stools. Our tables come in both standard height and bar height.